This is what I have come up with so far for my work SWAP. I still haven’t found fabic for the New Look shirt, but I think I will wait until I get the rest of my fabric in. I received my pants fabric in the mail last week (I’m cutting the pattern out today!) and ordered some more. 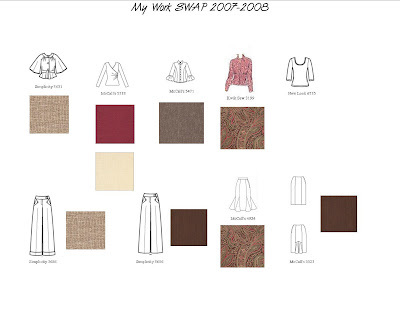 I love the pieces and colors you choose for your SWAP! It will be interesting watching it come to life. Okay. I love your SWAP. These items are going to look good.